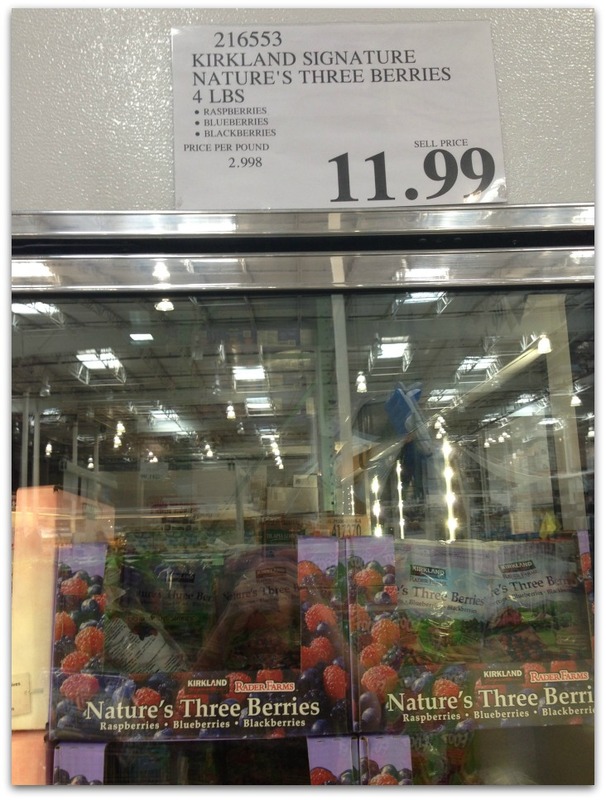 Note: these prices were in my local store in April 2015, your local Costco may be different than mine. Also, these are only good deals if you actually consume the food before it goes bad! If you can’t do that then consider splitting with a friend or buying just the non perishable items or freezable items. Finally, please excuse some of the pictures, then aren’t the best. I felt like a nerd taking pictures with my cell phone and tried to do it as discreetly and quickly as possible. 1. Romaine Lettuce. 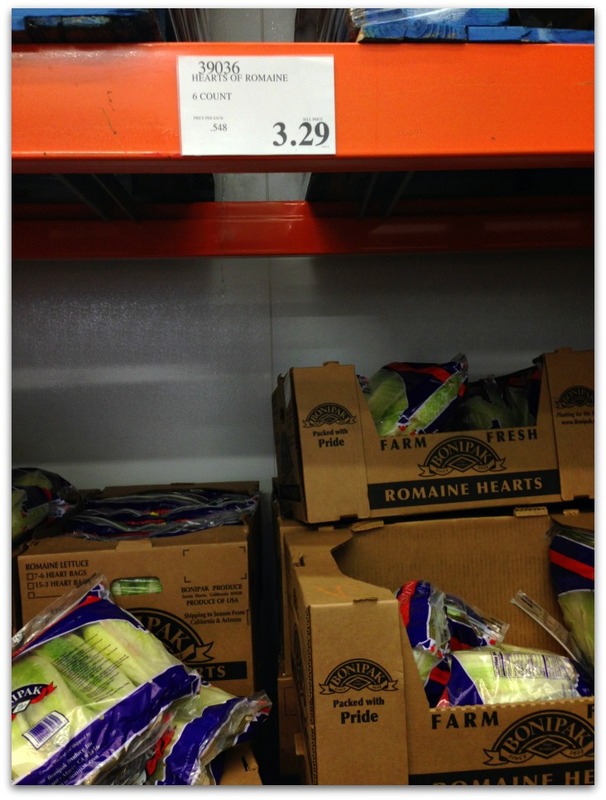 You get 6 heads of romaine lettuce for only $3.29. When I shop at my local Smith’s or Walmart you get a 3 count for about the same price. We eat a lot of salads at our house so we can usually get through all 6 heads before they go bad. If you know you won’t be able to do that you may want to split the package with a neighbor. For our salads we love using a salad spinner*. You wash the leaves and then spin off any excess moisture. When you have the tools to eat healthier it makes it so much more likely to happen! Don’t you agree? 2. Milk. 2 gallons of milk for $3.79 is a darn good deal if you ask me! That’s only $1.89 a piece which is probably the very good sale price at a regular grocery store. If you can’t drink 2 gallons of milk before it goes bad I recommend freezing one gallon. About 3 or 4 days before you’ll need the second gallon of milk put it in the refrigerator and let it thaw. 3. Fresh Meats (on occasion). My friend told me that she had purchased stew meat from Costco to make my freezer meals. I had a hard time believing that it would be worth it because typically pre-cut stew meat can be almost twice the price as taking a roast and cutting it up yourself. The next time I was at Costco I checked the price and sure enough stew meat was only $3.99 a pound which is actually just as cheap or cheaper than buying a roast and cutting it up yourself. I do believe the prices vary a lot between stores and even in the same store on different occasions. The past 2 times I’ve been into Costco I’ve checked the stew meat price and it was much higher than $3.99. So my message here is just check the meat section each time you go to Costco and see if you can find any great deals. You know you can always freeze meat. 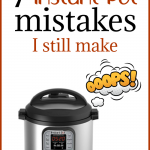 I really like stew meat for so many crockpot meals. On another occasion I bought pork loin for only $1.59 a pound. I cut it into 2 pound increments and froze it. Then I just throw it in the slow cooker with some BBQ sauce and we have BBQ pork salads for dinner (in fact that’s what’s for dinner tonight). So easy and inexpensive. 4. Bottled Water. 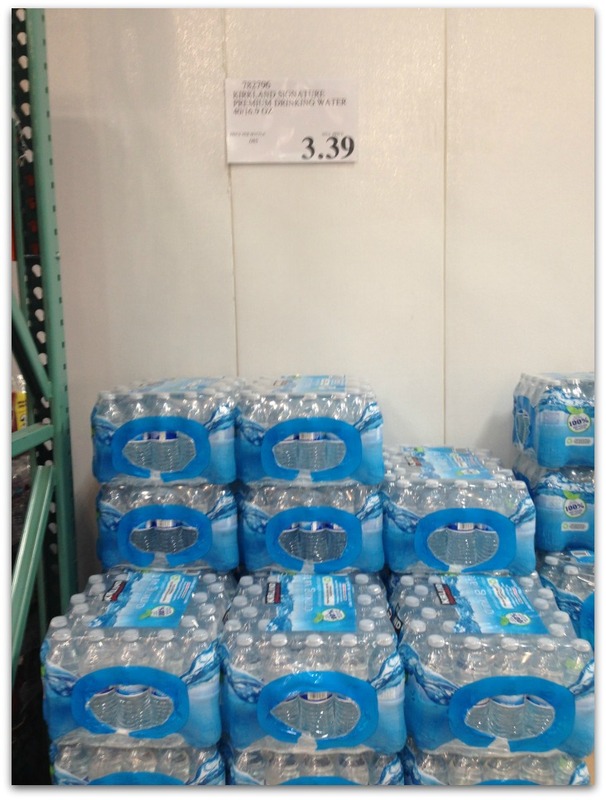 You can buy 40 (16 oz) water bottles at Costco for $3.39. I always like to go by the general rule that if you can buy bottled water for less than 10 cents a bottle that is a really good deal (these come out to 8.5 cents a bottle). I like to buy a case of these water bottles and throw it in the back of my van. Then when we have soccer or other sports we just grab what we need and it’s always there. 5. Fresh Spinach. 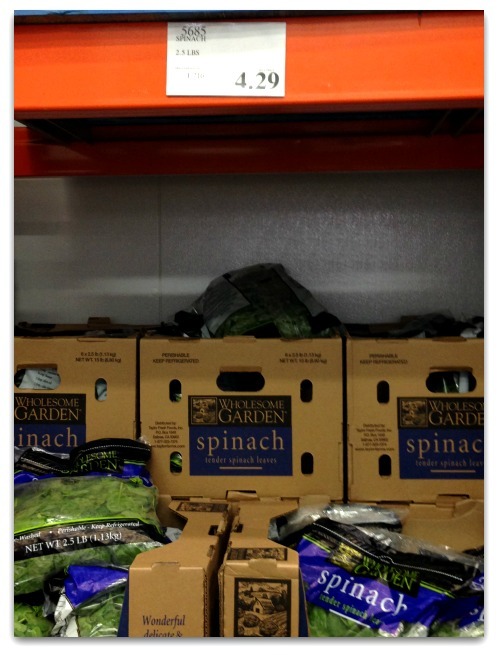 You can buy a huge 2.5 pound bag of spinach from Costco for only $4.29. That’s much cheaper per pound than the small 10 ounce bags you buy at a normal grocery store. However, I must say that I NEVER can get through this monstrous bag before it goes bad. So this is what I do–I take the bag straight from the store and throw it in the freezer. That’s it. Then I use the frozen spinach for my green smoothies in the morning! You could also steam the spinach and it would be good too. 6. Papa Pita Greek Flat Bread. Okay first off I just want to say how much I love these things. They are so so delicious! We love to brush them with olive oil and then put a little garlic salt on top and then bake them for 5 minutes and gobble them up! We also like to spread butter over the top and then sprinkle with cinnamon sugar and bake for 5 minutes. The taste and texture are spot on. I just love these pitas! You get a 12 count package for $2.79 which is less than the price of a 6 count bag at a normal grocery store. So totally a good deal! I keep mine in the fridge to keep them from getting moldy. 7. Bread (sometimes). 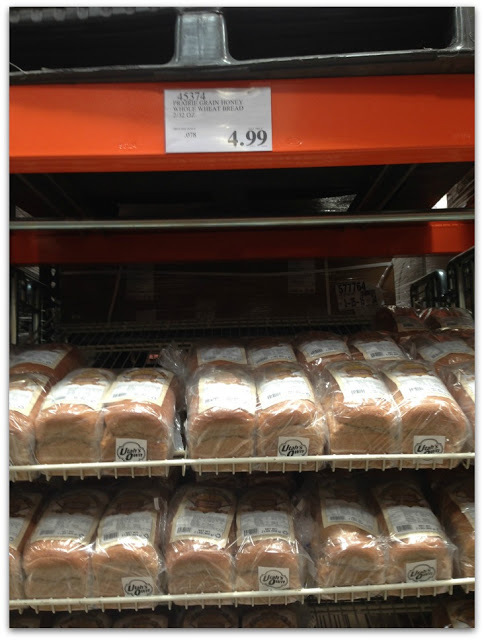 Sometimes you can find bread for a really good deal at Costco. For example this local Prairie Grain Honey Whole Wheat Bread is so yummy! But at a normal grocery store it costs around $5 per load. Expensive. But at Costco you can get 2 loaves for $5. And you can always freeze bread for later if you can’t eat both loaves quickly. However, not all breads are a better deal. 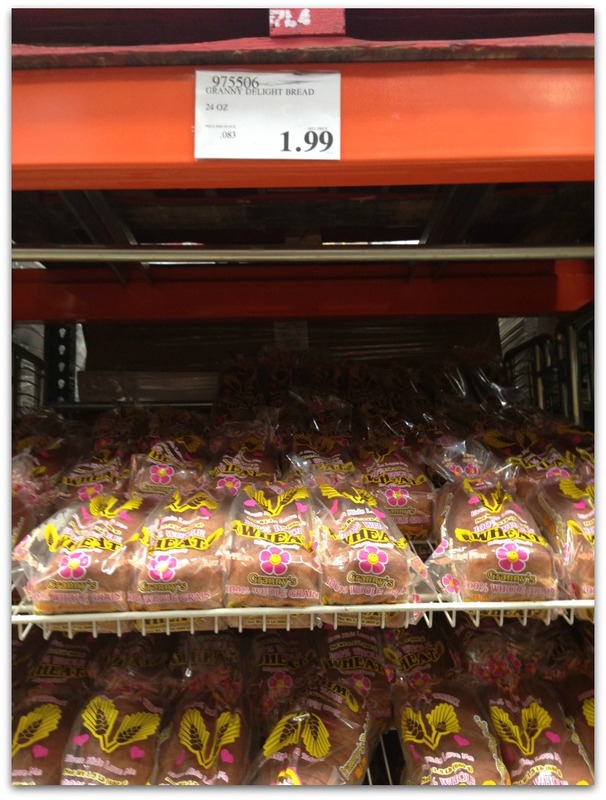 We also like this high fiber whole wheat bread but it’s not a better deal at Costco. It’s the same price as a normal grocery store (or very close to the same price). 8. Cheese (the Kirkland brand). 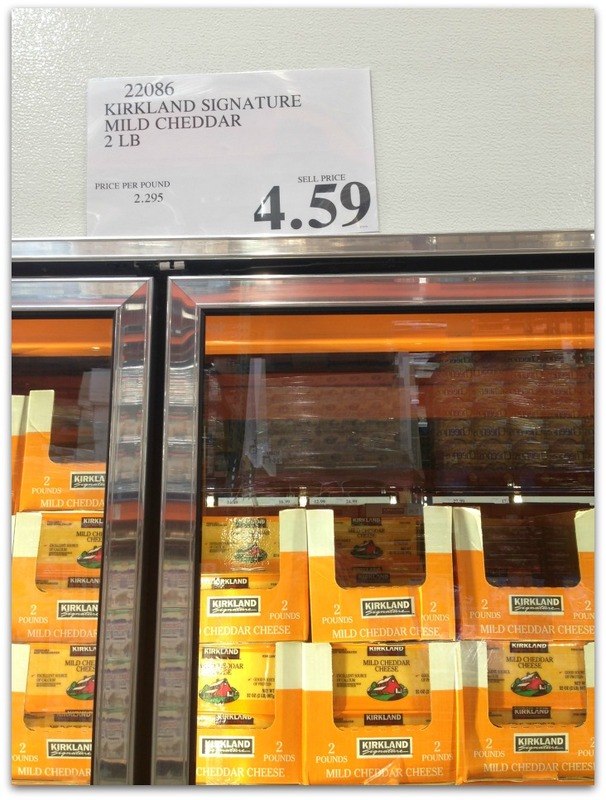 The Kirkland brand of cheese at Costco is a screaming deal. It’s only $2.29 per pound. At a normal grocery store the cheese would probably be closer to $3.33 per pound when it’s on sale. The good thing about cheese is that you can grate it up and freeze it and it works perfectly in recipes. It’s not always better to go bigger though. This 5 lb block of cheese is actually MORE expensive per pound than the 2 lb block of cheese. Weird. Moral of the story…pay attention to the little price per pound text. 9. Frozen Berries (Kirkland Brand). I love these berries! We use them for smoothies and I like to eat them in Greek yogurt. They are frozen so you don’t have to worry about them going bad. I feel like they are always flavorful. The berry medley at Walmart is about 24 cents per ounce whereas these berries are 18 cents per ounce. I do feel that these are better quality in addition to being cheaper. 10. 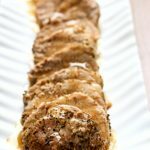 Boneless, Skinless Chicken Thighs (Kirkland brand). If you read the recipes on my blog you know I use boneless, skinless chicken thighs a TON! 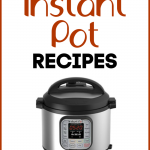 They work GREAT in the slow cooker and Instant Pot. I always buy a big bag of them in the frozen section at Costco. They cost around $2 a pound. I like how they are frozen individually and they are pretty much trimmed of excess fat. And let me tell you a secret, I rarely thaw my chicken before I put it in the crockpot or Instant Pot. 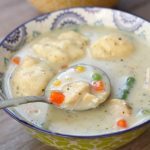 You could probably find chicken thighs that are slightly cheaper on sale at a regular grocery store but I’ve found that it is really hit or miss. They aren’t always easy to find. That’s why I just get them at Costco every time. So that’s my list! What would you add to the list? Hi just love Costco and wish there was more of them over here.hope to see them soon.or should I say al lot more in other areas soon.bye. Hi we want to start doing some shopping at Costco as I ve been very impressed by the website and what I saw and the things that they seem to do in fresh produce is great as it always looks really fresh and nice.and with what we saw. Would be great to purchase from them.but the only drawback is in England we only have one in london somewhere. And wish they come over from America and covered more areas.in England and I think that most people in England would definitely go there if they were available to go to like they are in America as in England the stores are very limited to what we have. And we would just love to see more of the Costco stores.come over here to England.in other areas as I just know that these stores would do really well across here I really do and I’ve even said it to my husband.and even he agreed with me.as he doesn’t really ever comment on anything unless he thinks it as he’s always very quiet most of the time like me.but this is something we personally think as we also think that most of your stores are just lovely and we just wish we had them here as they would do extremely well here I think and also my husband thinks so to as he’s said it as yours seems to have more choice and everything the whole thing.thats what we think thanks take care bye. These are great suggestions but may I offer an opinion that it would be great if the prices were current prices and not from 4 years ago. 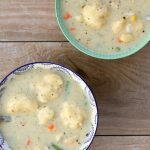 Always enjoy your recipes! This was posted in 2015!! Of course the prices are from 2015. Hey I love my Costco! I just thought I mention that their butter is a good deal. 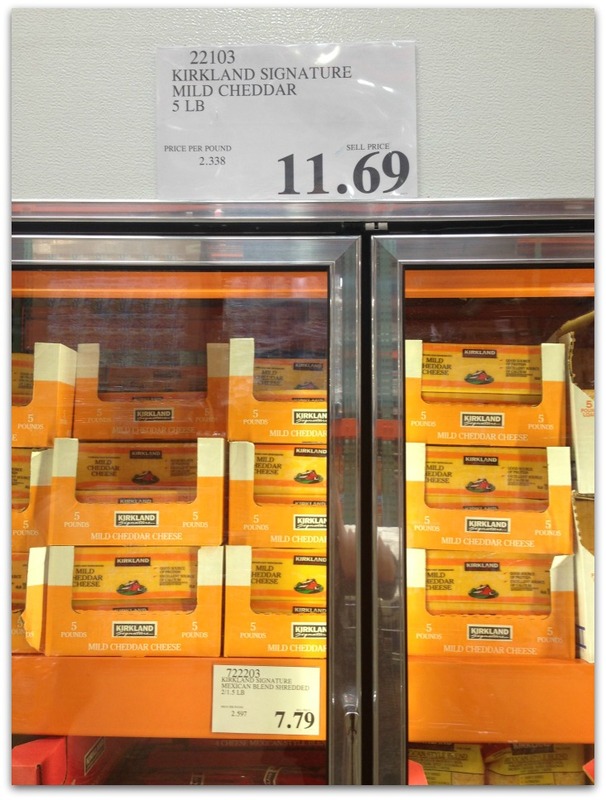 4-1 pound packages for around $ 10.95.
oh yeah, I love their butter! I love Costco , thanks for the great tips…. but lets try to leave the water bottles out of the equation…we should all be trying our best to not consumer water from a plastic bottle… huge waste of plastic. Agree. Bottled water is a complete waste of money and an environmental disaster with the “use once/throw away” model that’s filling our oceans and landfills. Also, leaving plastic bottles of water in anything but a freezing car is nuts. The plastic breaks down and that is not good. Stainless steel or glass water bottles (32-ounce size is my go-to) and a water filter is so much cheaper and won’t contribute to the epidemic of plastic waste. Costco, I buy avocados of course, wild-caught salmon, frozen organic berries, cauliflower rice, frozen edamame, raw unroasted unsalted cashews, 3-pound bags of brussel sprouts, avocado oil, coconut oil and more. Agree! We all should be doing away with single use plastic! There is no excuse. Pretty much everyone has a filter in their home fridge and there are plenty of reusable type bottles. I just received one as a gift call GULP. Keeps water cold or tea/coffee hot. Actually storing bottled water for emergencies is a perfectly good excuse for buying bottled water. I love the Costco lobster bisque! All @ Costco isn’t cheaper!!!! Also, they’re not helpful in finding things cause want u 2 walk + buy what no need. Not me! Only buy what I need! Rotissarie chicken good buy. At Rego Park Costco 1 Scooter. I needed 1. Rest broken. Won’t let me bring Service Dog! IDIOTS! Business!!!!! Some cashiers are nice, others aren’t. I know it’s hard job cause I’ve done it, but treat customers with respect especially if they say can’t pick up item! I use a Rollator walker with service dog named Scarlotte. I’m 67yrs old. Member of Costco since 1995!!!!!!! Long time member. Should be treated with respect! Just cause u have a great job with great benefits doesn’t give u rit 2 disrespect disabled members! Also, people petted my Service Dog Scarlotte without my permission + then complain 2 staff. Don’t pet her. You distract her from doing her job. Want to pet a dog. Buy one for yourself. Please remember that many customers of Costco are not polite or respectful of the Costco staff and they use their position of being a client to get away with terrible behaviour. I have never had an issue with Costco employees but I always expect a pleasant transaction and I act accordingly. You should pursue other avenues of shopping. Wow you sound very bitter I work at Costco and we always treat people well sounds like you have a sour attitude so I imagine you are like this most places you visit. Don’t worry about it we won’t miss you I promise. I have been shopping at Costco for 12 years and have always found the employees very efficient and courteous. 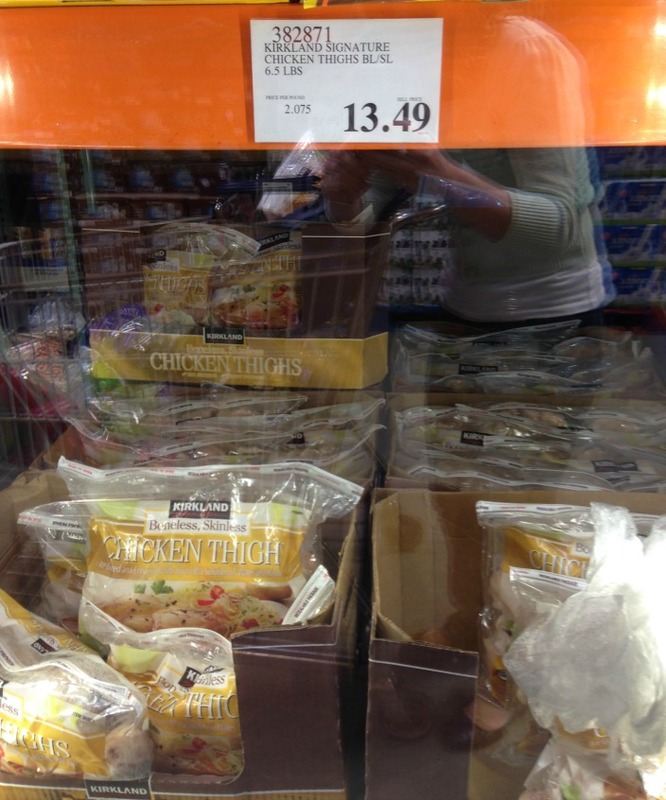 Best of all, Costco stands behind what they sell. If it doesn’t meet your expectations, they take it back. No questions asked. Good article! Thanks for posting. Wow Diana, you should seek some kind of counseling,, seriously you have some anger issues…. Caesar’s Kitchen Cannelloni Sausage = GARBAGE! Just a thought, but those chicken thighs are pretty expensive. I buy them by the basketful at the grocer for $1.49-$1.59 when they go on sale. I would much prefer using frozen boneless, skinless chicken thighs on the grill, but the Asian sauces I use; Yoshida sauce for example, or American BBQ sauce taste so much better if the meat isn’t also salted, as it sets off the flavors of both the sauce and the meat better. The Kirkland Pacific Bold kcups for our Keurig coffee maker. I’ve decided the Costco stew meat is too lean and flavorless. Slow cooking/crockpot cooking doesn’t tenderize it and the flavor is still lacking beyond the sauce. I would buy one of their inexpensive roasts and cube them yourself. Good thoughts Phil!! It’s been a long time since I’ve seen stew meat at my costco. I totally agree. I bought it once and it was very very dry and tasteless. Please, please, please think about the supply chain and quality of the fresh produce you are buying – I’m all for saving money but when it comes to meat, please keep in mind the sacrifices that have been made to price chicken or breakfast sausage at $2/lb. Less is more – please consider eating meat sparingly and focus your spending on quality, humanely raised products instead. Thanks! I am always looking at ways to save money with my grocery shopping. I like seeing what other people buy. 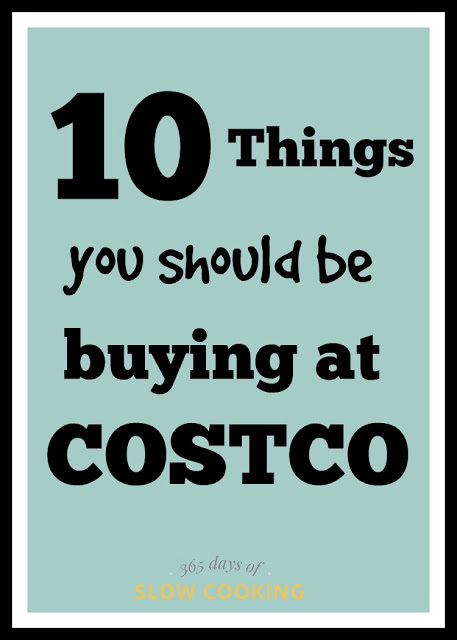 This is a great list, I buy spinach in cosco and almond butter. I love their breakfast sausage, as they don’t shrink much at all and taste better. I cook up the whole lot (like I am doing at this precise time, and bag them up so that I have enough for a meal. Makes breakfast a wiz, and they heat up nicely in the fry pan. Some great info. Thanks! I love Costco, but tend to buy my meats from Sam’s Club. They have case prices available, which are much cheaper than buying just one package of meat. I go in on a case with my sister splitting the cost and the room needed in my freezer. It’s also great for huge parties! 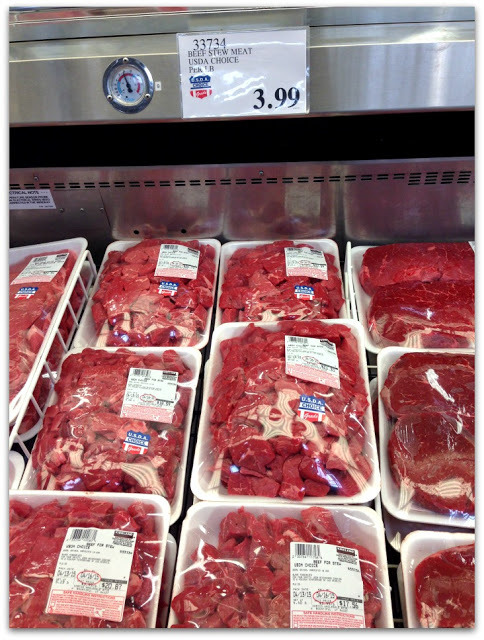 Check Costo’s policy and prices on cases of meat. If you don’t have a freezer, go in on a case with a few friends. Saving money is always a GREAT thing! Kirkland Toilet Paper is the best and buying in bulk just makes sense! totally…just bought a huge package of it yesterday! Kirkland has the best TP!!! Really like their laundry detergent pods, dishwasher tabs and liquid dish soap and tall kitchen trash bags, too!! I have been a Costco fan in England for 25 years. My constant list for value and very quality is thus. 10 Aberdeen Angus mince meat. The items available are different around the world stores. but their taste and use has not copped on here!!! Check to see if the fresh salmon is farmed. I stopped buying it at Costco because it is always farmed. You don’t want to eat farmed salmon, trust me! Also, the frozen shrimp aka king prawns are probably also from a farm. Not recommended. I love Costco otherwise! Not mentioned are Tomato Basil Soup, pizza, honey, and red hoop cheddar cheese. Suggestion, always try to purchase honey from your local provider. Local honey made from local plants builds a better immune system to local pollen and allergies. We only buy organic in my family and the only bottled water that I can stomach is for the emergency kit (please please stop buying it!!! They are so bad for the environment and your health! Most are very acidic which causes cancer.) BUT they have so much organic!!!! Yay for Costco. The organic eggs, frozen berries, guacamole and tortilla chips are my faves. I love to get feta cheese from Costco. It lasts forever and it is way cheaper than a grocery store. And I am pretty sure you can freeze it if you need to. I’d like to add: Kirkland Organic Chicken stock (not broth), it’s delicious! Also, walnuts and cashews seem to be a good buy. There is a local saying "Lucky we live Hawaii". Not so lucky with grocery prices. Each item you showed is $1-$3 more (yes, even per pound) than your prices. 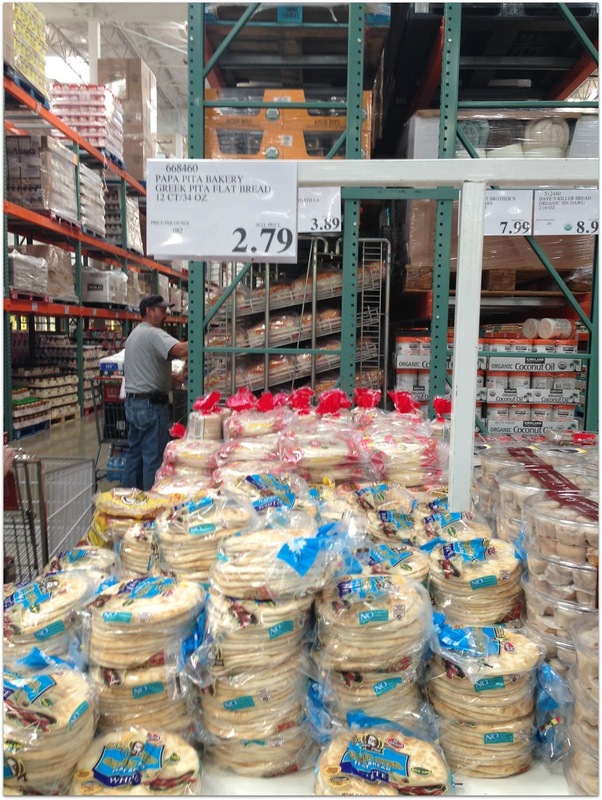 Costco is still a bargain on many things compared to regular grocery stores here. True but I would still love to live in Hawaii!! I find the cases of stewed tomatoes, refried beans and black beans to be a good deal too. You can probably find them similarly priced on occasion at the grocery but not at the frequency that we use these. Also the Jimmy Dean turkey sausages and breakfast sandwiches are much, much less expensive at Costco than in the small packs at the grocery. For our family of 5 it doesn't even make sense to buy the small grocery store sized packs anyway. I find the quality of the Costco brand canned vegetables superior to any I find in the grocery. The corn is more tender than frozen! I love Costco. I am a sucker for their Greek yogurt, baby carrots, and lettuce. Is it the kirkland brand yogurt? I've never tried that before. Their Kirkland Geeek yogurt is very good. I love to buy Fage 0% Plain Greek Yogurt. It is a huge size and way cheaper than buying the equivalent at the grocery store. Their rotisserie chicken is also the cheapest in town. Yes, the chicken is cheap and it's much bigger than a normal grocery store! I love Fage! I'm with Kalyn on the olive oil. I also buy rolled oats and ground flax meal at Costco because I've found they are cheaper than in grocery stores. My spouse and son love the giant vats of Sabra hummus and can eat quite a bit of hummus, so that value is a good one along with the pita chips or pretzel crisps. I've enjoyed a marinated olive salad and giant hunk of fontina cheese before, but haven't seen them recently. Oh! Almost forgot my favorite–Jones Dairy Farm sausage patties. I can read all the ingredients and they are flat, easy to cook, and fit nicely in an English muffin. Great suggestions, Kristen! I do love their hummus. I can't wait until they get the pesto hummus back. It's sooooo good! I totally agree with you about the romaine lettuce – what a deal! 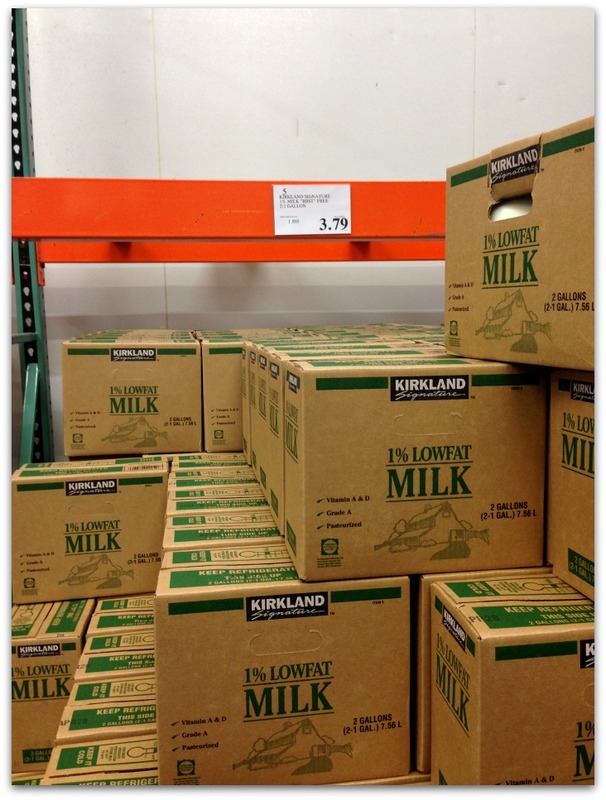 Costco also has Blue Diamond Almond Milk priced much less than grocery stores. 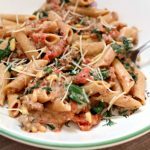 Costco's Kirkland brand Pesto is wonderful – if you haven't tried it I highly recommend it! I used to make my own but the price of pine nuts, even at Costco, is outrageous! Your cellphone photos were fine. Thanks for a great website! I use the vacuum sealing method Paula Rhodes espouses on her website “salad in a jar”. Keep the romaine much longer and salad ready, just have to clean and chop once! If you LOVE Mother EARTH, you won't buy into the idea that #4, suggesting you can buy water for less than .08 cents is a smart purchase. The smart purchase is to get yourself organized and bring your own reusable water container! YOU CAN DO THIS! Reduce, Recycle, Reuse! Recover & Repurpose. I love brita attachments! I have the brita faucet attachment, a prita pitcher for the fridge and brita water bottles! Taking the water bottles for use at a local restaurant that uses city water makes a HUGE difference in the taste. Its SO much better, and ends up being way cheaper than buying water bottles constantly, not to mention they are super wasteful! Other things I always buy there include olive oil (Kirkland Organic), Better than Bouillon Soup Base (giant size), nuts, and of course, rotisserie chicken! ooooh yeah totally good suggestions. The rotisserie chicken can't be beat!